Join us for a great opportunity for beginners and experts to pursue their family history and learn more about genealogy in general. Staff, volunteers and library computers will be available to help with your research. We will also have snacks and door prizes! A series of eight programs, presented in-house and remotely, will be in the meeting room from 10 a.m. – 8:30 p.m. 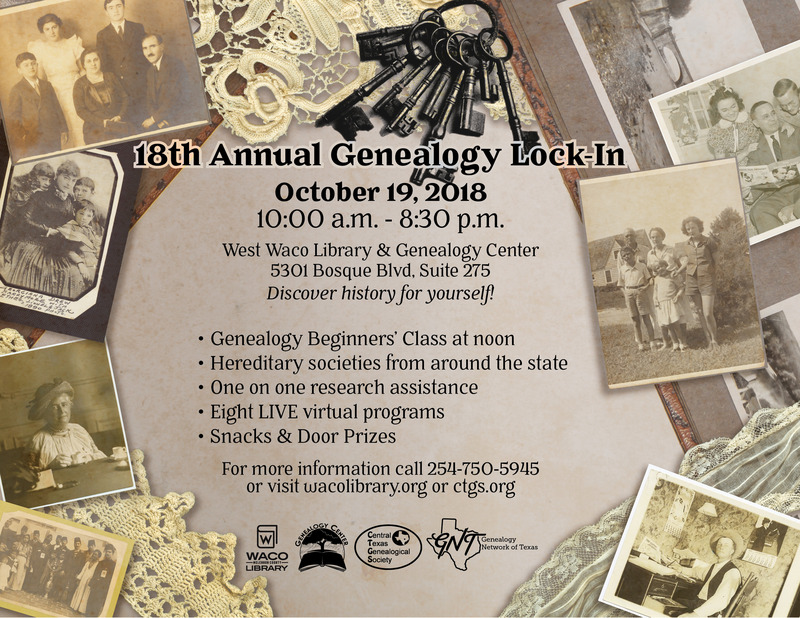 The programs are provided by the Genealogy Network of Texas (GNT), a state-wide initiative to connect libraries/genealogical societies and provide educational and research opportunities. Topics covered will include census records, brick-wall research, autosomal DNA, Native American ancestors, preserving photographs, using land records, and locating female ancestors. Beginning at 4:00 p.m. local programs will be presented in the storytime room. Topics covered will include comparison of family tree software, a look at the hottest free online resources, how to make the most out of Find-A-Grave, and preserving oral history. Click here for a list of participating libraries.